A truly glorious old pile! The great house now known as Saturation Hall, standing high on the wild moorland of Langstonedale Chase, has a long and proud history. It's thought there had been a hall here since the dark ages, when an old Saxon family fleeing west from Viking attacks on the East coast settled amid the great forest which originally covered the moorland. However the current hall dates to 1395, when the newly enobled Baron du Chase, having impressed King Richard II, was granted the lands. By 1425 the first part of the main house, the great hall, and adjacent kitchens and solar, were completed, and over the next few hundred years the baron and his desecendants built a solid and imposing manor, a home for the family and a shelter from the winter wolves and wild moorland weather for their servants and retainers. 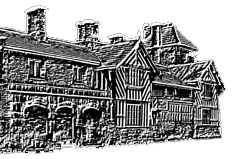 History does not record what the building was originally called, but by the sixteenth century it was known simply as "Langstonedale Hall", named after the valley below. The name remained unchanged until the time of the third Lord Langstonedale, who in the mid eighteenth century travelled to Holland, and there became fascinated with the building of canals and the drainage of land. On his return to England, he became involved with, and eventually took charge of, the project to drain the marshes around New Guisingthorpe, eventually resolving the miriad problems that had originally beset the project by the construction of the "Saturation Drain", paid for from Lord Langstonedale's own funds. The drain worked, the drainage project was a huge success, and made the family's first fortune. As a symbol of it, he officially renamed his ancestral mansion after the drain, and thus "Saturation Hall" came into being. Given that the family's peculiar habits of bathing fully dressed, and requiring their maidservants (and possibly also manservants, though the historical detail is unclear on that point) to also regularly receive fully clad drenchings, was already long established by this point, it's entirely possible that the name-change was also a nod to family humour. The family's interest in science and engineering carried on into the 19th century, and they were an influential force in the development of the Industrial Revolution. Unusually for a landed family of the period, the Earls of Langstonedale, as they had now become, were all in favour of the construction of the railways, and made shrewed and very successful investments in the new railway companies that were uniting the country as never before. Even more unusually, they were champions of both women's education and the universal franchise, with the daughters of the house receiving a technical and scientific education quite equal to that of the sons, and being sent into local industrial works and onto the railways as apprentice engineers. This raised many eyebrows and incurred the wrath of more than one pillar of the church, but in Victorian England one did not argue with wealthy landowners bent on progress and reform. The family's peculiar taste for fully clothed bathing continued through the generations, and when the Seventh Earl of Langstonedale, Lady Jasmine's great grandfather, inherrited the estate in the early 1880s, he set about his restoration and building spree at the hall with more than half an eye to assist these habits, installing all manner of devices and facilities to enable family members, guests, and even the household servants, to indulge themselves to the full. 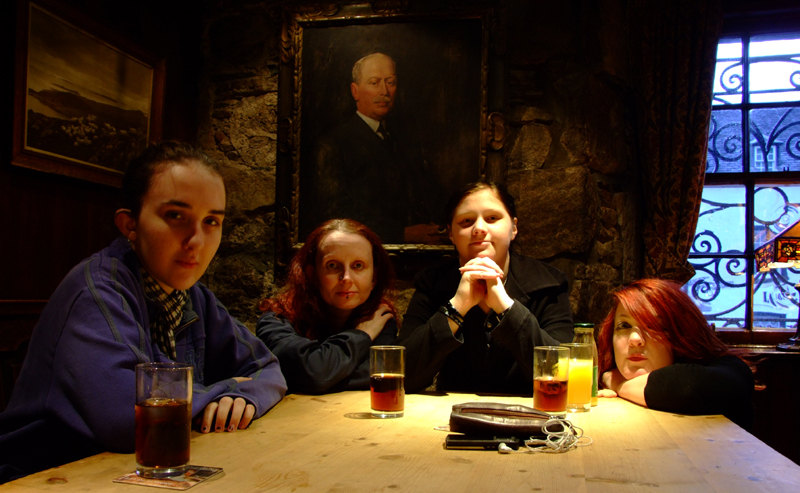 Lady Rose, Lady Amaranth, Nurse Wendy, and Morgana, at the hunting lodge. The house today is little altered from the Seventh Earl's time, save for the introduction of electricity in 1909, a telephone system in 1937, and Internet facilities in 1995. From here Lady Jasmine commands her large estate and even larger financial portfolio, and indeed the Lords and Ladies of Langstonedale Chase can look forward to a long and prosperous future here at Saturation Hall.